Expensive, but this gaming laptop puts many desktops to shame. We’ve been asked a more than a few times why there aren’t any gaming laptops with mechanical keyboards, and up until now our response has always been, “Because that would be stupid.” MSI has thrown traditional laptop conventions out of the window by introducing its GT80 Titan, the world’s first gaming laptop with an integrated mechanical keyboard, and slap us on our butts and call us Sally if it doesn’t work in its own little, or shall we say, big, way. Specifically, the GT80 Titan uses a tenkeyless keyboard designed by SteelSeries, outfitted with Cherry MX Brown switches. The keyboard also supports red LED backlighting. Overall, it looks and feels surprisingly great. The Brown switches offer a nice sense of tactility without being too noisy. While it is a tenkeyless keyboard, MSI has also interestingly integrated its trackpad on the right side, sort of like what Razer did with its Razer Blade 17-inch laptop. The placement of the trackpad is a little awkward, but you’ll get used to it eventually. And by holding pressing the num lock key, the track pad doubles as a numpad, which is kind of neat. The keyboard and trackpad aren’t the only unique features of the laptop. The GT80 Titan also features two GeForce GTX 980Ms. These two mobile GPUs easily beat a desktop 980, and interestingly enough, a single 980M has 8GB of VRAM vs. the desktop equivalent’s 4GB. The 980Ms here feature core clocks of 1,030MHz, memory clocks of 1,253MHz, and boost clocks of 1,127MHz. The laptop also features a Haswell i7-4720HQ CPU that’s clocked at 2.6GHz (with a boost clock of 3.6GHz). To go along with the quad-core/eight-thread CPU is 16GB of DDR3 RAM. Storage side, the laptop rocks 256GBs of SSD storage in RAID 0, and it has a 1TB HDD, too. All of this is housed in the large bay above the keyboard. While laptops generally aren’t too modular, the GT80 Titan allows you to access this bay to swap out its storage drives, RAM, and even its MXM GPUs. In regard to the chassis itself, the GT80 Titan features a plethora of features and ports. There’s basically everything you need here to act as your desktop replacement. While its panel isn’t likely to be as big as your favorite standalone monitor, its 18.4 inch screen is big for a laptop. It has great colors and fantastic viewing angles. There is no touchscreen, however, which definitely would have been nice to have. Our biggest gripe with the monitor, however, is that it still uses a 1080p panel. With all that firepower, you’d think MSI would include either a 3K or 4K display. Hell, a 2560x1440 panel would have made much more sense. The problem of course is that no other manufacturers are shipping higher resolution 18.4 inch displays, leaving us in a chicken vs. egg situation. For acoustics, the GT80 sounds really good. The speakers are by Dynaudio and the laptop even has a subwoofer on the bottom; you’ll get plenty of volume. The laptop also has two unique buttons: one that allows you to switch between integrated and discrete graphics, and one to enable “cooler boost,” which basically pushes the fans to a really loud 100 percent RPM. Luckily, the graphics cards perform like champs without enabling tornado mode to keep things cool. Seriously, the GT80 Titan obliterated our Alienware’s 765M GPU by a performance delta of 260–360 percent. With its 1080p panel, you can max out every single game out now with silky smooth frame rates. It’s actually way overkill for 1080p. CPU performance wasn’t nearly as killer—its processor performed about as well as any modern gaming laptop’s i7 would. We saw a 4 percent improvement boost in our x264 benchmark compared to our ZP, where the GT80 Titan’s extra 200MHz headroom allowed it to eke out a win. 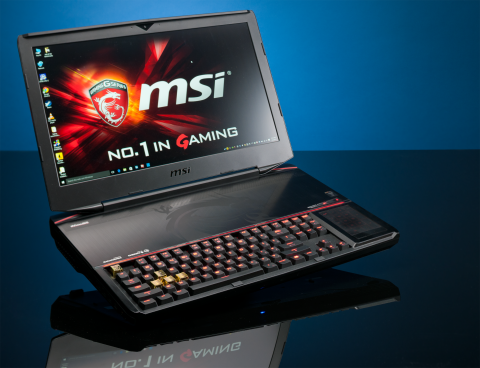 Somehow, MSI was able to judo the laptop’s weaknesses into its greatest strengths. Sure, the mechanical keyboard bloats up the chassis, but you’re getting some larger-than-life power out of this bad boy as a result. Overall, the design is kind of brilliant as a desktop replacement. For $3,300, it is expensive as hell, but it also packs one hell of a punch.